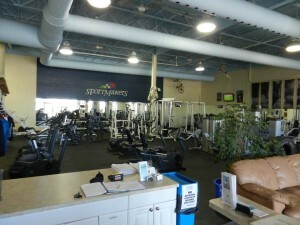 A view of the space inside Sportsmakers. Young, athletic with boundless energy and infectious grin, Joshua Burnett doesn’t look like a typical entrepreneur building a successful business in Grey Bruce. Joshua was just 26 years old when he purchased Sportmakers Fitness & Training Centre in September of 2011 from Bob Hooper and his wife Mijka, who also own Dancemakers, a dance and gymnastics studio in Owen Sound. As owner, personal trainer and kinesiologist, Joshua oversees the exercise and training needs of 225 members and personal training clients. His location is a 6,000 square foot fitness training facility with 25 pieces of cardio equipment, 6,500lbs of free weights, and numerous selectorized and cable machines. It targets both athletes and non-athletes who want to exercise in a large, bright location with no wait times to use the equipment. Membership fees are less than that of Owen Sound’s new Regional Recreation Centre. Joshua squeezed in time for an interview with the GBBJ, while making protein shakes and greeting each arriving and departing member by name with encouragement and humour. Well, I didn’t start this business from scratch, but I have put every cent I have (and then some), I work 70-80 hours per week and I love every minute of it! It was a huge risk, but has been worth it. So yes, I guess I would definitely call myself an entrepreneur. It didn’t take me long to figure out that the owner of the business was taking most of the money and I was doing all the work. I later bought my own equipment which I paid off in just a few days and kept the profits. It was a great life lesson. Why own you own business? I learned early about working for yourself. In high school and university I sold lawn aeration services door-to-door. It didn’t take me long to figure out that the owner of the business was taking most of the money and I was doing all the work. I later bought my own equipment which I paid off in just a few days and kept the profits. It was a great life lesson. But owning your own business wasn’t your first choice after university? You’re right. I graduated in Kinesiology and wanted to do something related to fitness, but owning a training facility was not on the horizon. In fact, I spent a few years teaching English as a second language (ESL) in South Korea. I then went to Teachers College and then taught ESL and Phys-Ed in Saudi Arabia. In between, I continued in the lawn aeration business. That’s a big jump from Saudi Arabia to Owen Sound? Not really. I was raised in Owen Sound and while in Saudi Arabia I began reading a number of books and researched online about entrepreneurism and owning your own business. I decided that what I really wanted to do was to combine my passion for fitness and owning a business. While living in Owen Sound I had been a member of Sportmakers, so I contacted the owner Bob Hooper asking for some advice and if he would be a mentor as I searched for a fitness facility to purchase. I inquired about purchasing Sportmakers and within a few months I acquired the business. Has your earlier entrepreneurial experience been helpful? Not really, selling door-to-door didn’t really require business skills – just salesmanship. I’ve had to do a lot more thinking about business owning Sportsmakers. In some ways I was naive. It looked like an easy way to make money without having to work very hard. I quickly learned that I had to drill down about this business – to watch finances, put in the hours and pay down my business loans as quickly as possible. In hindsight, what is the most important trait you need as an entrepreneur? Passion! You’ve got to love what you’re doing, everyday and every moment. You lose the passion – you lose the business. What do you least like about owning your own business? I have to put in the hours and perform a lot of the tasks you would rather pay someone else to do. I’ve cleaned the washrooms and the equipment, vacuumed the floors, put out the garbage and a whole lot more. It’s not glamorous stuff for a business owner, but has to be done to keep expenses low. What’s been your biggest struggle? Trying to find systems and procedures that work for me and the business. It’s taken a while to get the accounting, scheduling and day-to-day operation working with minimal effort and oversight. I’d also have to say that finding dependable, responsible and personable employees is always a struggle. I’m fortunate to have a great team working for me now. And one more thing – I never seem to have anytime to eat! How difficult was it to buy a business in Owen Sound? It wasn’t easy. The banks saw me as a young, untested borrower with no collateral. You would have thought buying an 8 year old business with a healthy membership base, solid cash flow and equity in the exercise equipment would have been an advantage when it came to the banks. Their policy was to treat Sportmakers as a start-up with no financial history or assets. That was a tough sell. My parents had to co-sign the bank loan and I was fortunate to qualify for an additional loan from the Bruce Community Future Development Corporation. I want to keep Sportmakers personal, membership friendly and small enough that it feels like a family. Where do you see yourself and Sportmakers in 5 years? Most entrepreneurs would talk about growth, expansion, franchising, etc., but I want to keep Sportmakers personal, membership friendly and small enough that it feels like a family. 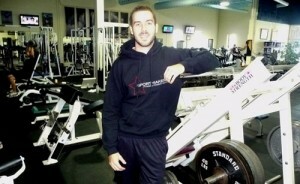 I might grow the membership to 300 and I would like to add more personal training clients. It’s also possible that in time the facility will be open 24 hours a day. It would be great to target more seniors and develop special programs for their needs. What advice would you give to someone wanting to be an entrepreneur? Doesn’t matter what you want to do in business, you have to have passion, be personable and knowledgeable, motivated and street smart. And in Grey Bruce you have to recognize that it is a seniors market. It’s very difficult to start a business that doesn’t cater to them. I was lucky with my business because all age groups are concerned about fitness, but you’ve got to keep your eye on the seniors if you want to succeed.